The dragon and I are both sniffly and gross, so I did some research on the best ingredients to put into our breakfast smoothie. Now because I work professionally in an area in which we apply a high level of scientific scrutiny into our research, I need to add the disclaimer that only a small proportion of my research for this blog comes from peer reviewed journals, and I am not a nutritionist or dietician by trade. OK disclaimer aside. Now I can get back to this with a clear conscience. 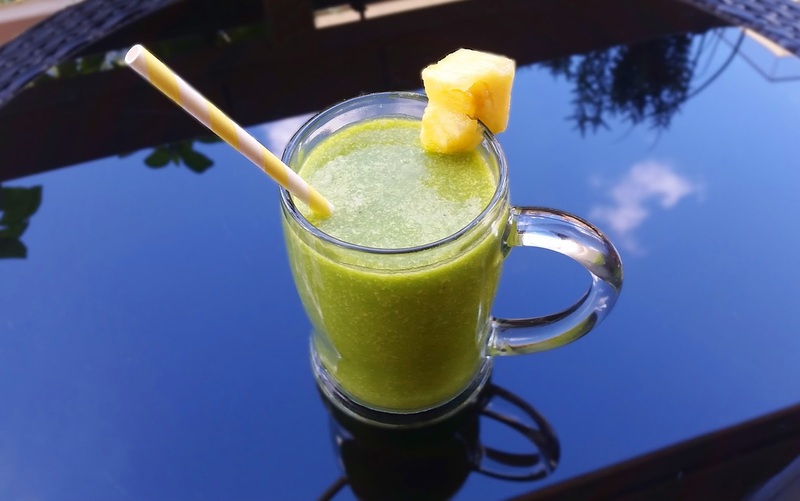 This smoothie/juice is packed with Vitamin C from the pineapple, orange and OJ (please do NOT substitute 100% orange juice for orange drink or the like), and has iron in the spinach (which is more readily absorbed by its combination with citrus fruit). Ginger, turmeric, cinnamon and honey are all classic go-tos for natural cold and flu remedies, and turmeric is most readily absorbed by the body when combined with a healthy fat, hence the coconut oil. The banana is there just to give it a bit of creaminess. Health benefits aside, it was zingy and tangy and helped. Taking an eccinacea tablet with this can be a boost as well. The Dragon swears by his own cold busting recipe – he calls it “medicinal rum”. This version is strictly non-alcoholic. Especially since consumed at breakfast! Swap the 100% OJ for a non-dairy milk alternative like unsweetened almond milk or coconut milk. Avoid using cows milk – it will give you all the mucous – ew! The idea of anything milky or creamy was not appealing to me at all because of the milk-mucous association given that I have only recently gone off dairy most of the time, so I opted for the OJ. There are heaps of other cold and flu busting ingredients out there you could sub in – research and go nuts! Blend! Serve however you like.